Birds on Tap – Roadtrip: Harlequins and Hops! 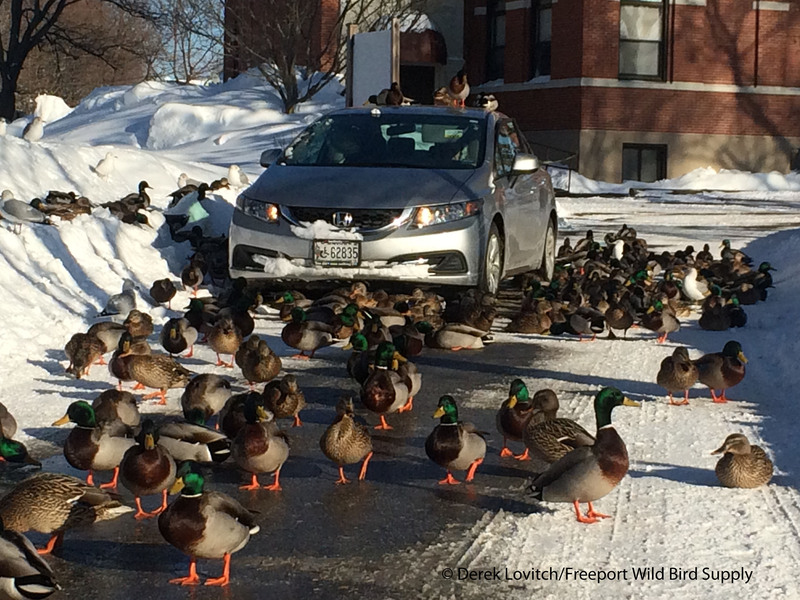 The first new “Birds on Tap – Roadtrip!” of 2018 with our partners, the Maine Brew Bus, was a resounding success. We enjoyed harlequins, hops, and so much more – including a much-hoped-for rarity. We even saw just about every single species suggested in the itinerary. And it was gorgeous out! We had begrudgingly postponed the tour from the previous week due to the fear of ice in the morning and heavy rain and fog during the day. But the light winds, temperatures in the upper 30’s, and limited rain that the day actually featured made us wonder if we had lost the gamble. And when we woke up to 6-10” of snow (and not the 4-6 forecast!) on the morning of the 18th – and the resultant extra time clearing the driveway – I was definitely viewing the decision in hindsight. However, the sun soon came out, the roads melted, and the temperature warmed to 40-degrees. A strengthening southerly wind was a little raw at one stop, but otherwise, it was impossible to beat the weather for a tour in February…and the fresh coating of fluffy snow only added to the aesthetically-pleasing scenery of the birding day. Furthermore, the coastal storm that spun through overnight was perfect for producing some nearshore pelagic alcids (members of the puffin family), which really got our hopes up for a life bird or two. 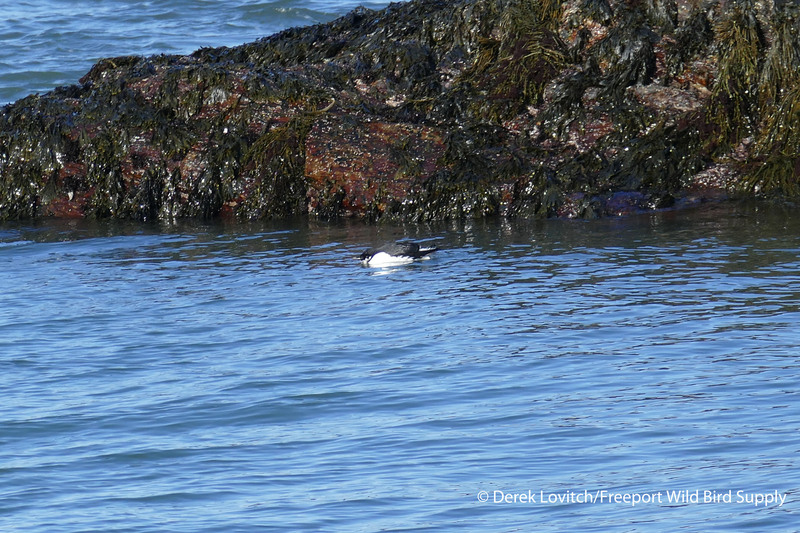 We began at Dyer Point in Cape Elizabeth where we soon spotted the namesake quarry of the tour: a dozen snazzy Harlequin Ducks. We were already half-way to our titled goal for the day, but of course, we were only getting started. 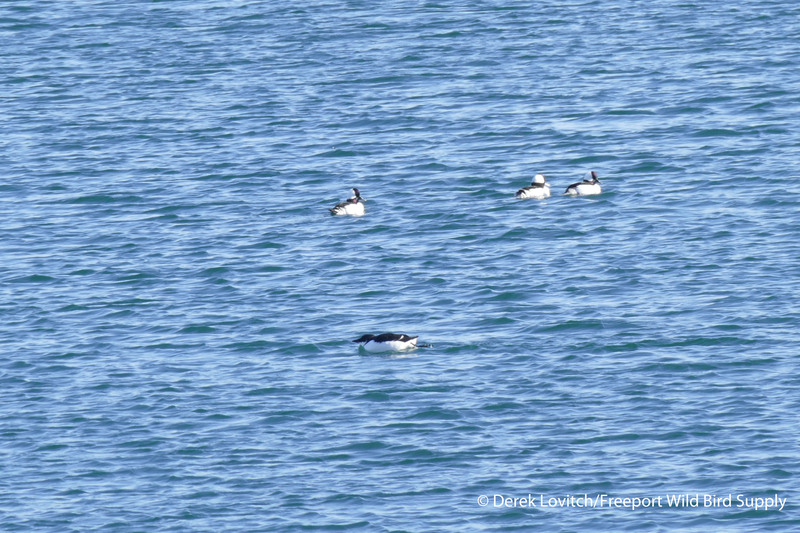 At nearby Two Lights State Park, we enjoyed several more Harlequin Ducks, lots of Common Eiders, Black and White-winged Scoters, and one Red-necked Grebe while we took in the breathtaking scenery. I spotted a Dovekie – one of the most sought-after winter specialties of the region. It was sitting on the water (had it just flown in?) with a group of eider just off the shoreline, and in perfect light. It was feeding, diving under for a minute or two at a time, but eventually, everyone got great looks through the scope, and lots of photographs were taken. Barely larger than a starling, this hardy little bird spends most of its life on the open ocean, and only comes to land to breed and nearshore in specific conditions in winter than include storm tracks, winds before and after, offshore food supplies, nearshore food supplies, and likely other unknown factors. It was a bird we only hoped for today, but a life bird for just about everyone in the group; this was a find that was soon to be celebrated! A few Purple Sandpipers were spotted at nearby Kettle Cove as were Surf Scoters and several Common Loons, but with a southerly wind and choppy water building, I decided to make a turn inland and head for some sheltered waters. Finding that at Mill Creek Cove in South Portland, photogenic, stunning Red-breasted Mergansers stole the show, and a 1st-winter Iceland Gull was teased out of the flock. A short, pleasant walk through Mill Creek Park yielded hundreds of Mallards (BoT veterans know how much I enjoy looking at, and talking about, large aggregations of Mallards! ), and among them, the overwintering hen Wood Duck – a real rarity in winter! Although lacking the gaudy, over-the-top coloration of the drake, the subtlety-beautiful hen with her glossy bronze and green tertials and over-application of white mascara was enjoyed by all. One last stop at the Portland fish pier, was another chance to see Iceland Gulls – actually, we saw 7 of them, including a darkly-marked adult – and offered the opportunity to get up close and personal with several of our spiffy wintering sea ducks, such as this handsome drake Long-tailed Duck. The benefit of this winter itinerary is that there are countless birding locales to visit, with worthwhile stops given almost any weather (or travel) condition. Therefore, Paul had to rein me in – the birding was so good, I certainly wanted to keep going! – and with that, we departed, and I handed the proverbial microphone over to our esteemed beer guide for the day. Paul took the lead and escorted us to eighteen twenty wines in Portland, our only winery visit on the 2018 BoT schedule. Making wine from Maine-grown rhubarb, and hard cider in small batches from Maine-grown apples, this was going to be a unique and educational experience. Maine became a state in 1820, and it was also the first year were rhubarb was found in the public market, we soon learned. A very traditional beverage, rhubarb wine was popular – especially for medicinal purposes – in the early 1800’s. We were treated to two wines, and two ciders. The first wine was Wintrus, a rhubarb wine aged in cabernet barrels, which imparted notes of the cabernet and oak-y woodiness, adding a little complexity to this rather light wine that was perfectly positioned between dry and sweet. The strawberry-rhubarb Honeoye was next, with plenty of strawberry flavor, but only a little sweeter and nowhere near the expectations of an overly-sugared strawberry-rhubarb pie which is its inspiration. Ohm was our first cider, an “English Eastern Counties-style:” dry, light, and uncarbonated. This was soon followed by what turned out to be the crowd favorite, Ohm’s Law, the Ohm aged in cinnamon whiskey barrel. Reminiscent of an apple pie, but again, without the overt sweetness, and likely due to the lack of carbonation, finishing with a soft and smooth buttery flavor. We also learned about the trials and tribulations of opening a new winery – especially given the legal definitions and the lack of grape vines in this “urban winery,” as well as future plans that include experimentation with the 60+ varieties of rhubarb. The long commute to the other side of the building (this itinerary was designed to reduce driving, just in case the roads were normal-February snotty) presented us with the second half of the tour’s title: the hops. And hops were abundant and well spoken for in the brews of Goodfire Brewing Co, the newest brewery in the burgeoning “Yeast Bayside” scene. We were handed samples of one of their IPAs, Prime, which I’ll admit my bias – it has rapidly become one of my favorite beers. A citrusy juice-bomb, I was keen to have the group compare it to our second selection, Waves. Also a hazy, New England-style IPA, this beer features complex tropical fruit notes instead. Earlier, Paul had inquired about what beers and other beverages people did and did not like, and quite a few people on the bus proclaimed themselves as “not IPA fans.” New England IPAs are not your bitter IPAs of old, and so I wanted to challenge people’s ideas of what an IPA is, and hopefully open some minds. I was therefore rather pleased when one of those self-proclaimed non-IPA fans proclaimed Prime as their favorite beverage of the day on the ride back home. Mission accomplished! The final sample was a choice between the hoppy “table beer” saison, Tiny Wrist Circles, and the hot-off-the-presses Hydro, their latest Double IPA. I’ll give you one guess to what I had, and then went home with! It was a quick and easy commute to our Portland meeting location, followed by a smooth and clear drive to Freeport for the rest of us. Conversation included Dovekie ecology, IPA diversity, and what an amazingly beautiful winter’s day we had just experienced. Something tells me Harlequins and Hops will be back! This entry was posted in Birding in Maine, Birds on Tap - Roadtrips, Private Guiding and Tours and tagged "Birds, Birding, Birds on Tap, Birds on Tap - Roadtrip!, Cape Elizabeth, Dovekie, Dyer Point, eighteen twenty wines, Goodfire Brewing Co, Harlequin Duck, Harlequins and Hops, Iceland Gull, Kettle Cove, Mill Creek Cove, Mill Creek Park, South Portland, The Maine Brew Bus, Two Lights State Park, Wood Duck on February 21, 2018 by Derek. A Warbler (and Sparrow) Big Month. In December. In Maine. December was unusually warm. In fact, it was record warm. And not just barely… records were shattered. The average temperature for the month was 38F. Not only was that a ridiculous 9 degrees above normal, it smashed the previous record of 24.8F (set in 2001). Surprisingly, despite the everlasting warmth, record daily highs were rare. Christmas Day was an exception, however, when temperatures soared to 62 in Portland, crushing the previous record high of 53, set just last year. Our first measurable snow of the season didn’t fall until December 29th – the second latest date on record. Those 5-8 inches in southern Maine finally ushered in “real winter” and hopefully set the stage for a return to more normal conditions (although the last few days have once again been 5-10 degrees above normal). Not surprisingly, such an unseasonable month resulted in some very-unseasonable birding. A variety of “lingering” or perhaps more accurately “pioneering” as Ned Brinkley, editor of North American Birds once dubbed it warblers in particular were making headlines. So I decided to do a December Warbler Big Month. Because, well, warblers in December! In Maine! With Tennessee, Yellow (2! ), Nashville (2! ), Common Yellowthroat, and Wilson’s on December 6th, I was half-way to my newly-set goal of 10 species for the month. The unusually mild fall has allowed more “lingering” birds to survive longer, and normal November hotspots are still hot (literally and figuratively). Unfortunately, I waited until December 8th to decide to embark on this silly little hunt, so I had some catching up to do. There were some relatively easy ones (Yellow-rumped Warblers overwinter in a few places, along with “known” Blackburnian and Pine Warblers). That meant I just need to find an Orange-crowned Warbler (the second most-regular December warbler after Yellow-rumped) and then one other stray. Not wanting to take any species for granted, I twitched a Pine Warbler that was reliably coming to a feeder in Brunswick on the 10th. I had to wait all of three minutes for it to arrive on my way back from walking Sasha. If only they were all this easy! The next day I was once again at the Saco Yacht Club, looking for the Blackburnian Warbler (which I saw on Nov 30th – one day too early!). Activity didn’t pick up until the fog finally lifted after 10am, but I ran out of time. I did, however, enjoy another visit with the Tennessee, and 1 each of Yellow and Nashville Warblers. 2-3 Ruby-crowned Kinglets were also present, and a Yellow-rumped Warbler dropped in: my 7th species of the month! That and the Western Tanager were the consolation prizes (yes, I did just relegate the tanager to a consolation prize…shame on me… but I “needed” the Blackburnian!). I worked hard for an Orange-crowned Warbler in Portland on the 13th to no avail, but I did turn up the continuing Nashville Warbler along the Eastern Promenade (oh look, Portland ravaged vegetation here, too!) and a Gray Catbird on Sheridan St. I also took time to go visit the continuing Ross’s Goose along Stroudwater St in Westbrook – the third I have seen in Maine, and only the 6th or 7th state record. Continuing the quest, I had high hopes for the Southern York County Christmas Bird Count on the 14th. With a great territory that almost always turns up a good bird or three, Jeannette, Kristen Lindquist, and I worked the marsh, thickets, neighborhoods, and beach of the “Moody” sector. And we did indeed have a great day, including the 2nd Count Record Clay-colored Sparrow, the 5th Count Records of Baltimore Oriole and Lesser Scaup (21 – also a record high), and 6th Count Record of Dickcissel. But alas, not a single warbler. We didn’t even get a Yellow-rumped – for the first time, as there was virtually no fruit on the bayberry bushes along Ogunquit Beach or anywhere else. When my friend Evan Obercian found a Yellow-throated Warbler at the Samoset Resort in Rockport on the 13th, my goal was definitely in sight (this was the “additional rarity” I needed), but in the weeks before Christmas, finding time was going to be a challenge. Luckily, a break in my schedule – and the rain – came on Thursday the 17th, so I got an early start and headed east. I met up with Evan and Kristen and we wandered the grounds of the Samoset for almost two hours. I was not happy to find a stiff onshore breeze when I arrived, and it was increasing over the course of the morning. Then the mist rolled in, and soon, a steadier drizzle. There were not a lot of birds around (other than Canada Geese and Mallards on the golf course), and I was beginning to work on a plan to come back again. And not long thereafter, it called! We spotted it in an isolated cluster of Scotch Pines, very near where Evan first saw it (and where we walked by 3 times already this morning). We followed it for about 30 minutes as it relocated to another grove before heading over to the hotel building, where it proceeded to forage in the sheltered porches of the four story building! Presumably gleaning insects from old webs in the corners and around furniture, clearly this bird had figured out a novel way of finding sustenance – especially on such a snotty day. It was my 8th warbler of the month. I was back to the Saco Yacht Club with Luke Seitz the next morning, once again hoping for the Blackburnian. We worked the hillside and surrounding habitats hard, and absolutely cleaned up! The quick glimpse of a fly-by Western Tanager was more frustrating that satisfying, but we had great looks at the continuing Tennessee, Yellow, 2 Nashville, Common Yellowthroat, 2 Ruby-crowned Kinglets, and then, finally, the Blackburnian! My 9th warbler of the month! I had a little more time, so I made a quick trip down to Biddeford Pool. Working the neighborhood and thickets, I found a small group of Yellow-rumped Warblers (4-5), a nice addition to the day list. Besides, up until now, I had only seen one all month! I was in the midst of plotting “Operation Orange-crowned” when I wandered over to look at a chattering Ruby-crowned Kinglet. A loud chip note caught my attention, and I looked up to see this Prairie Warbler – my 10th species of warbler for the month (and 7th of the day)! But did you really think I would stop at 10? Hunting for Orange-crowns in Portland and South Portland on the 21st, I turned up a Baltimore Oriole on Sheridan Street (likely the same individual that Jeannette and I found here on 11/23), and along West Commercial Street (in what’s left of the vegetation here! ), I had a Swamp Sparrow, and a Field Sparrow – my 8th sparrow of the month. Hmmm…do I need to go for 10 sparrows, too? So I went to Scarborough Marsh the next day, and quickly picked up a Savannah Sparrow along the Eastern Road Trail for #9. Jeannette and I, post-holiday madness, continued the search on the 28th, combing the coast from Kittery through Wells. While nothing new was added, we did find three different Swamp Sparrows (two at Fort Foster, 1 in York Beach), and most excitingly, we relocated the Clay-colored Sparrow that we found on the CBC – a mere one block away. Once again, however, I managed only some quick phone-binned photos. A Northern Flicker and 5 Yellow-rumped Warblers were at Wells’ Community Park, while other highlights included 14 Sanderlings with Purple Sandpipers along Marginal Way in Ogunquit. But before I knew it, it was December 31st. 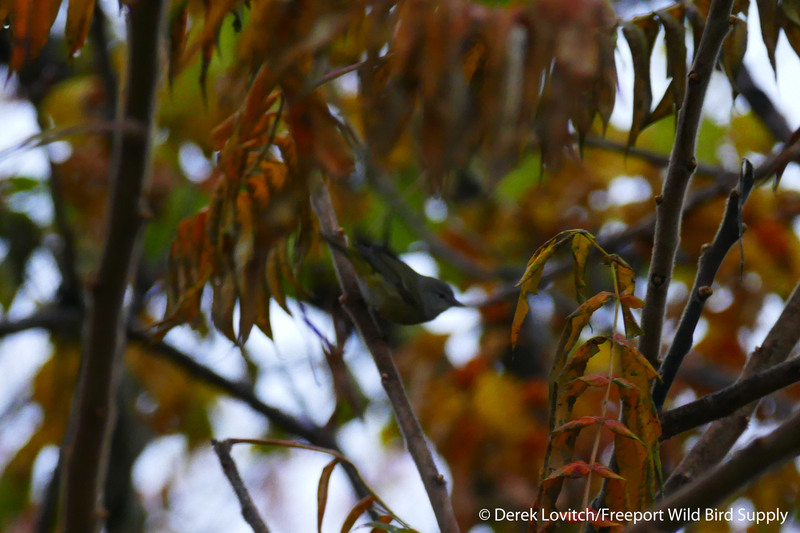 I still had yet to see an Orange-crowned Warbler (inconceivable!) for the month, and I was stuck at 9 species of sparrow. Therefore, Phil McCormack and I had a mission when we set out in the morning. We worked thickets and fields in Cape Elizabeth, with stops at various nooks and crannies in South Portland and Portland. While we did not relocate the Lark Sparrow along Fessenden Road (it’s been a week since I have seen a report), we did have a Merlin there, and a couple of Yellow-rumped Warblers at Crescent Beach State Park. Luke had an Orange-crowned Warbler at Camp Ketcha back on the 20th, but it was rather devoid of birds today. Throughout the day, pockets of Song and American Tree Sparrows were indicative of recent movements and concentration following the snow and ice, but we were not prepared for the concentration of sparrows at a particularly fruitful patch. In fact, it was astounding! 75+ American Tree and 50+ Song Sparrows flew out of the field, joined by 10 or so White-throated Sparrows and 20 or more Dark-eyed Juncos. A continuing female Brown-headed Cowbird was there, along with at least 80 American Goldfinches and 30 or so House Finches. A Carolina Wren sang from the woods, and two Swamp Sparrows and a female Common Yellowthroat were in the marsh…I knew my 10th species of sparrow was here somewhere! After a teasing brief, distant but highly suggestive look, I finally found it – a Chipping Sparrow! My 10th species of sparrow in December! But of course, I still wanted an Orange-crowned Warbler, so we kept birding (well, after a long, celebratory lunch of course), and I tried a few more OC spots in Portland after Phil departed. I still can’t believe I saw 10 species of warbler in Maine in December, and none of them were Orange-crowned, but it seems a fitting finish to the month, and the year, was the continuing Baltimore Oriole and Gray Catbird sitting in the same tree in the Sheridan St lot! Meanwhile, some other highlights over the course of the month, of the non-warbler or sparrow variety, including more seasonal species, such as two Snowy Owls on a Saturday Morning Birdwalk on the 12th, my first Iceland Gull of the season (finally) in Old Port on the 15th, a Snowy Owl at Biddeford Pool on the 18th, Harlequin Ducks, Purple Sandpipers, and a growing legion of wintering waterbirds. Other signs of the unseasonably warm month included a lingering Double-crested Cormorant in Portland Harbor on 12/15, a few more lingering dabblers and Great Blue Herons than usual, but surprisingly, I didn’t see a Hermit Thrush all month – had they all moved on or would some now show up as the snow and ice pushes them to coastal migrant traps? But the most unexpected of them all was the Little Blue Heron that was found in the tiny Jordan Park Marsh in Ocean Park. I stopped by to visit it on the 22nd, about two weeks into its unseasonable stay. Unfortunately, as much fun as this month has been – and as nice as it has been to not yet wear my parka – it’s impossible for me to ignore what this all means: the climate HAS changed. While no one month – warm or cold – is “climate change,” it is impossible for any rational person to not realize that our weather has become more and more unpredictable, less and less “normal,” and prone to more and more wild swings in seasonal and within-season variability. No, a hot day doesn’t mean Global Warming, nor does a snowstorm mean there’s not (Please James Inhoffe, please go away and shut the hell up). But the trends are real, very apparent, and very much here. Now. And they are most definitely affecting birds and bird migration. That being said, I would not use these warblers as an example of this. Instead, I think the fact that here in December and they are still ALIVE, is however, a perfect example of just how ridiculously warm our weather has been! 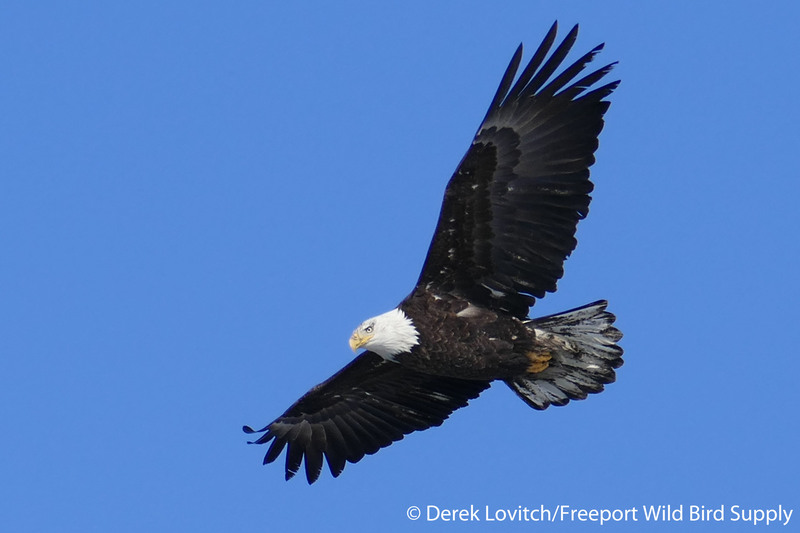 The mechanisms that delivered these birds to the Saco Riverwalk and elsewhere are likely varied. Perhaps the deformed, crossed-bill of the Tennessee Warbler impedes its ability to efficiently forage and put on the necessary weight for its next leg of migration. Perhaps the extensive southerly winds that have ushered in this warm air also facilitated the arrival of a 180-degree misoriented migrant Yellow-throated Warbler, and I would propose, the Prairie Warbler as well (I think the rare-but-regular late fall Prairies are actually birds from our south) that were “messed up” and flew the wrong way. But it is also possible that some of these warblers are “reverse migrants” that started to go south and then turned around, but I doubt it – facultative migrants like swallows and blackbirds do it, but I don’t know of any known proof that long-distance Neotropical migrants pull it off (on purpose, anyway). These mechanisms occur every year, and rare warblers are found at places like the Saco Riverwalk every fall. However, they’re usually found in October and November and either move on (or, more likely perish) by now. So I think what’s remarkable is not that all of these warblers are here, but that they are still ALIVE well into December – and that is most definitely due to the mild winter so far. There have still been insects to be found, there’s plenty of fruit left to consume, and fewer calories have been spent to keep up internal body temperatures, meaning there are fewer calories that need to be consumed. Migration in long-distance, obligate migrants is not triggered by temperatures, but trigged by physiological changes directed by hormones responding to the changing length of the day. In the fall, southbound migration is triggered in part by a response to changes in fat loading to fuel these epic journeys. At some point, the controls are switched away from building the fat reserves that are necessary for migration. I don’t know at what point in the season “pioneering” warblers lose the ability (perhaps, even the “desire”) to migrate. 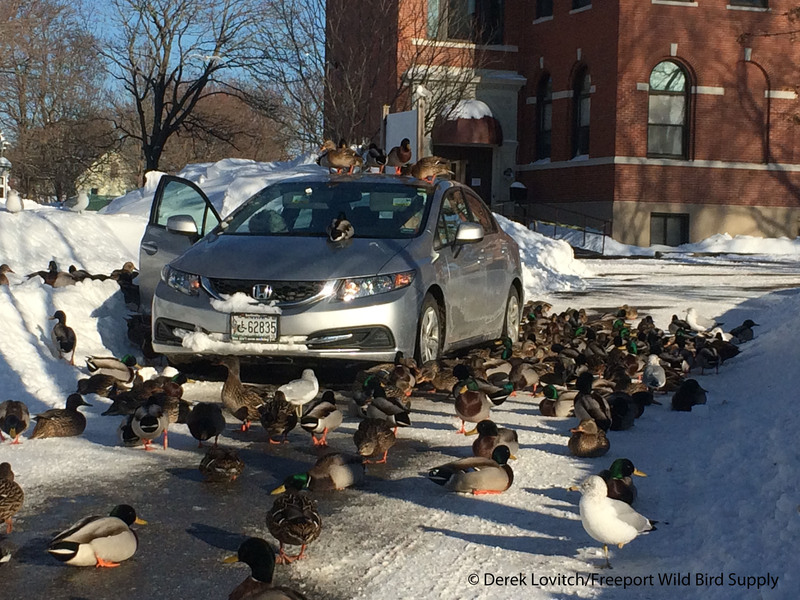 My guess is that even if you pumped these birds full of fat, at this point, they won’t be going anywhere – this is now their winter territory, for better, or for most likely, worse. So what does this mean besides some amazing early winter birding? Good question. Conventional wisdom says these birds are all “evolutionary dead ends” that will soon be eliminated from the gene pool (it has to get cold sometime, right? If they’re not picked off by a Sharp-shinned Hawk or all of the damn outdoor cats that hunt there). However, with the effects of Global Climate Change clearly upon us, and not reversing anytime soon (if ever), perhaps these “pioneers” are the wave of the future. Maybe someday, warblers will successfully overwinter in Maine, and return to their breeding grounds to pass on those genes. Maybe. Afterall, without vagrancy, we would not have Hawaiian honeycreepers or Darwin’s finches; distant islands would be sans all landbirds. Perhaps phenomena like “reverse migration” and this pioneering thing will allow the next wave of adaption to a changing climate. Of course, never before in the history of life on earth, has this change occurred so rapidly, and we have little evidence suggesting long-distant migrants can adapt this quickly – it’s going to take more than a few individuals of 10 species of warblers. Sparrows, however, aren’t obligate long-distance migrants that are “programmed” to leave at a prescribed time. Instead, they are more flexible in their movements, and being seed-eaters, they aren’t reliant on warm-weather dependent insects. As long as seeds are available, and with the complete dearth of snow, they most certainly have been, those that linger can do just fine. White-throated, American Tree, Song, and Dark-eyed Juncos are all regular parts of our winter avifauna in southern Maine, lingering or “pioneering” Swamp Sparrows are regular here and there, and every now and then a Lark Sparrow (a “drift migrant/vagrant” from the Midwest) or Field Sparrow spends the winter in the state. Field and Clay-colored are also rare-but-regular in late fall/early winter, so once again, the presence of 10 species of sparrows is also not in and of itself caused by the record temperatures, but it is most definitely another sign of how mild – and especially snow-free – it has been. This entry was posted in Birding in Maine, Rarities and Vagrants, Weather and tagged "Birds, Baltimore Oriole, Biddeford, Biddeford Pool, Birding, Cape Elizabeth, Chipping Sparrow, Clay-colored Sparrow, Field Sparrow, Gray Catbird, Little Blue Heron, Maine, Pine Warbler, Portland, Prairie Warbler, rarities, Rockland, Ross's Goose, Saco, Saco Riverwalk, Samoset Resort, sparrows, vagrants, warblers, Weather, Western Tanager, winter, Yellow-throated Warbler on January 2, 2016 by Derek. Not Your Usual December Highlights! While this fall’s rarity season got off to a fairly slow start at the end of October, things have really heated up lately. In fact, it’s been a really outstanding couple of weeks. And in the past few days, I have enjoyed some really great birding. The mild temperatures have certainly played a role – while the southerly and southwesterly winds that have ushered in much of the unseasonably warm air may still be facilitating the arrival of some vagrants, at the very least the mild temperatures and benign weather are allowing vagrants and unseasonable “lingering” migrants to survive long enough to be found! And, the lovely weather is certainly keeping more birders out in the field. I have certainly been taking full advantage of this beautiful weather. …and we saw one of the two Ruby-crowned Kinglets still present (much more regular in December than any warbler). And although we didn’t see it, the most amazing of them all, a Blackburnian Warbler is still present. (Jeannette and I saw and photographed it earlier in the week, 11/30). The Grasshopper Sparrow was also our fifth species of sparrow on the day (Song, American Tree, White-throated, and Dark-eyed Junco) – I doubt I’ve had five species of warbler and 5 species of sparrows in the same day in December in Maine before. Of course, that only somewhat consoled us about missing the vagrant Western Tanager that was found at the Riverwalk later in the afternoon. Damn. On Monday, I headed over to Reid State Park in Georgetown with Kristen Lindquist. It was a rather quiet day here, but it’s always one of my favorite places to take a walk, especially on such (another) gorgeous morning. 43 Red-necked Grebes, a Northern Harrier, a flyover Red Crossbill (my first of the season), oh yeah, and another rarity: “Oregon” Junco. While some might dismiss it as “merely a subspecies,” the westernmost subspecies of the Dark-eyed Junco is truly a rarity in the Northeast, and this was the first definitive “Oregon” Junco that I have seen in Maine (although I have never chased one at a feeder, where they are usually seen). It was in a small flock of “Slate-colored” Juncos and an American Tree Sparrow in the scrubby central ridge in the middle of the Griffith’s Head parking lot. The flock flushed from short grass at the edge as we rounded the corner, and as it briefly alighted in a shrub, I was shocked to see a black-hooded junco. Closer inspection as we followed it for about 20 minutes yielded all of the pertinent field marks for a “textbook” Oregon, nicely eliminating the intermediate “hybrid swarm” – or whatever it is – that we sometimes refer to as “Cassiar’s” Junco. Afterwards, Kristen and I birded around Bath – no white-winged gulls or Barrow’s Goldeneyes yet, no doubt related to the mild temperatures as well, but we did spot one of the Snowy Owls at Brunswick Landing – unlike warblers, a slightly more expected highlight for early December in Maine. While Jeannette and I didn’t turn up any rarities – or much of anything else for that matter! – birding Harpswell Neck this morning, I very much look forward to what the coming weeks will produce, especially when it finally turns cold! This entry was posted in Birding in Maine, Rarities and Vagrants, Weather and Birding and tagged "Birds, "Oregon" Dark-eyed Junco, Birding, Blackburnian Warbler, Cape Elizabeth, Common Yellowthroat, Dyer Point, Georgetown, Grasshopper Sparrow, Nashville Warbler, rarities, Reid State Park, Ruby-crowned Kinglet, Saco, Saco Riverwalk, Snowy Owl, sparrows, Tennessee Warbler, vagrants, warblers, Weather, Wilson's Warbler, Yellow Warbler on December 8, 2015 by Derek. Rarity season is upon us, and there’s no better time for a big ol’ storm. Especially with an impressive southerly flow before and during the storm, and a strong cold front clearing things out behind it, my “Rarity Fever” symptoms got fired up. Heavy rain Wednesday night into Thursday gave way to a few hours of well-above normal temperatures and mostly sunny skies before winds and rain began to pick up in the late afternoon ahead of the cold front. I was able to squeeze in a visit to Sabattus Pond in the early afternoon, hoping for storm-grounded waterbirds. While it was simply gorgeous out, the waterbird numbers remained below seasonal-norms here. A continuing pair of Redheads was the highlight, and a pair of White-winged Scoters was just the type of rare-inland migrant seaduck I hope to find after some weathah’. Otherwise, waterbird counts were modest: 219 Ruddy Ducks (well, modest for Sabattus – this is an epic count for anywhere else in the state! ), 164 Lesser Scaup, 75+ Ring-billed Gulls, 62 Mallards (not sure where the masses were today), 41 Bufflehead, 39 Greater Scaup, 36 Ring-necked Ducks, 16 American Coots, 13 American Black Ducks, 11 Canada Geese, 2 Common Loons, 1 Mallard x black duck hybrid, and 1 Double-crested Cormorant. On Friday, with southwesterly winds (more rarity wind!) gusting ahead of a secondary cold front, I spent the morning in Cape Elizabeth. While I had Cave Swallow on my mind, I settled for a nice mix of late migrants, including four species of warblers (Orange-crowned at Kettle Cove, my 4th of the year; Blackpoll and “Western” Palm at Pond Cove, and scattered Yellow-rumps), a Gray Catbird at Kettle Cove, and an Indigo Bunting on private property. With a light (but decent-for-the-date) migration overnight, I started at sunrise at “My Office” at Sandy Point to take in what’s left of the Morning Flight. Calm winds seemed to preclude as many birds from reorienting here as I would have expected based on the decent-for-the-date radar image overnight. However, it was a very pleasant morning with nice little flight featuring good late-season diversity. I tallied a total of 247 migrants, led by an even 100 American Robins, 66 Dark-eyed Juncos, and a nice total of 14 Snow Buntings. “Tardy” birds included 3 “Yellow” Palm Warblers, an Eastern Phoebe, 2 Hermit Thrushes, a Red-winged Blackbird, and best of all, a late Black-and-white Warbler that I found in the trees after my Saturday Morning Birdwalk group had joined me. But on Sunday, vagrant-hunting was the name of the game. Although I did not organize a South Coast-wide “Rarity Roundup” this year for the first time in a decade, Kristen Lindquist, Evan Obercian, Jeannette and I ran my usual Portland Rarity Roundup itinerary, scouring the Portland peninsula for vagrants, “lingering” migrants, and other surprises. 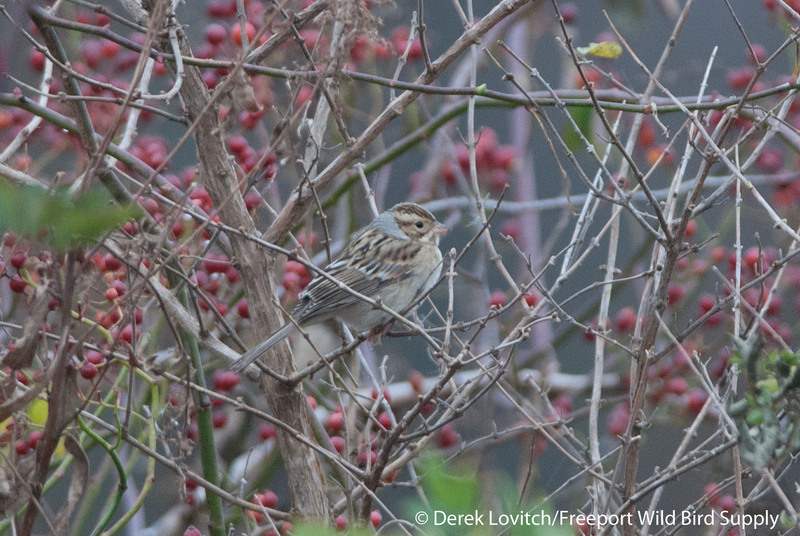 It was not exactly the birdiest of days on the Portland Pen’ but the Eastern Promenade was fairly productive, led by 2 Orange-crowned Warblers, a Palm Warbler, a Field Sparrow, and three Hermit Thrushes. Here’s a terrible shot in the dawn dark and drizzle of one of the two Orange-crowns. Elsewhere in the East End, we turned up a Hermit Thrush on Anderson Street, and a Gray Catbird on Sheridan Street, but then the passerines really dried up. 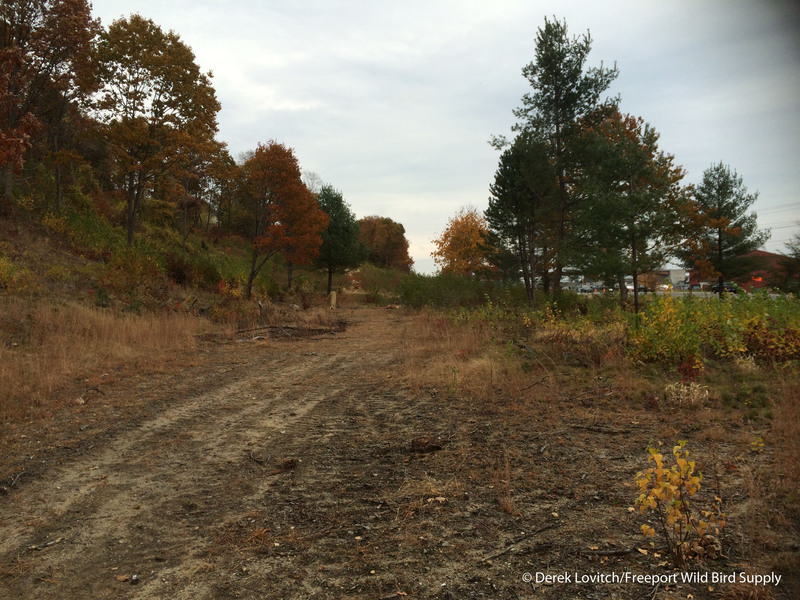 The usually-productive stretch of woods on either side of West Commercial Street has been rendered useless, and was essentially devoid of birds. But it’s a city, and development occurs, and there are lot worse places for trees to be cleared. The abandoned railyard and old docks along this stretch of degraded river is hardly habitat worth conserving. “There are more important places to protect,” as Evan stated. However, it was at least some habitat for tired and disoriented migrants that found themselves in the city and looking for food and shelter. What a mess, and what an abomination! And what a waste. So yeah, there weren’t any birds here, either. 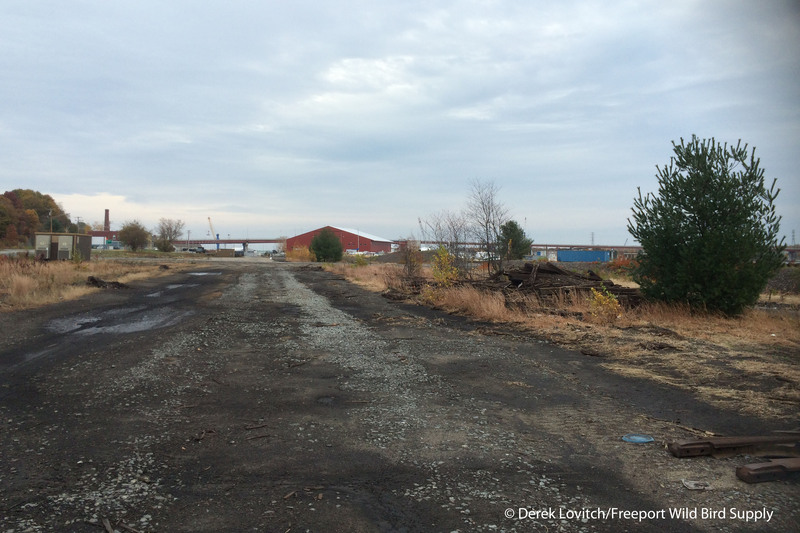 So after lunch, we gave up on the city (and crossed off several birding hotspots from the list…don’t get me started about what they have done to the Fore River Parkway Trail area!) and headed to Cape Elizabeth. Unfortunately – especially with an increasing southerly wind in the afternoon – it wasn’t overly productive here. In fact, several of the best hotspots were incredibly slow – as slow as I have ever seen them at this time of year. However, we did hit some hotspots, led by a great amount of activity at Trundy Point. 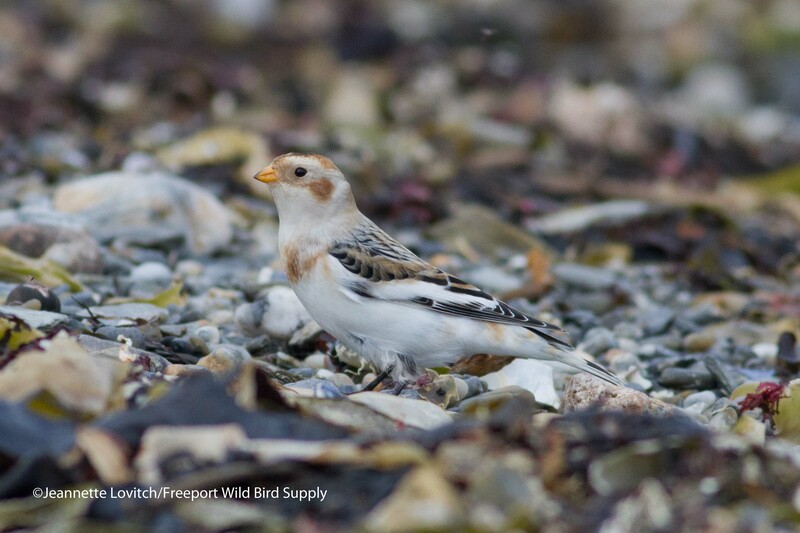 The five Snow Buntings on the beach were nice (photo below), but a feeding frenzy of 40+ Common and 6 Red-throated Loons, a single Red-necked Grebe, 1 Bonaparte’s Gull, and a goodly amount of Herring and Great Black-backed Gulls made for a fun visit. Northern Gannets were diving further offshore as well. Maxwell’s Farm was productive, too: 17 Eastern Bluebirds, 5 American Pipits, and a Wilson’s Snipe led the way, and we had another snipe flying over little Joe’s Pond Park in South Portland. Mill Creek Park might have been the birdiest stop of the day – even if it was almost all Mallards and Ring-billed Gulls, however! We then finished up the day, with the sun setting, at Portland’s Back Cove, with arguably the bird of the day – a late American Golden-Plover going to sleep with 9 Black-bellied Plovers and 5 Dunlin at the edge of the marsh. It was a nice way to cap an enjoyable day of birding with good friends, with the senseless optimism of Rarity Season keeping us going through nearly 14 miles of walking and searching. No major rarities were to be found at Reid State Park on Monday morning, either, but Jeannette and I enjoyed a lovely, birdy walk on a beautiful morning. 8 late Semipalmated Plovers joined 151 Sanderlings on the beach, along with 8 American Pipits and 18 Snow Buntings. A lingering Nelson’s Sparrow (subvirgatus) was in the saltmarsh, and we spotted a Northern Harrier flying south, low over the water offshore. 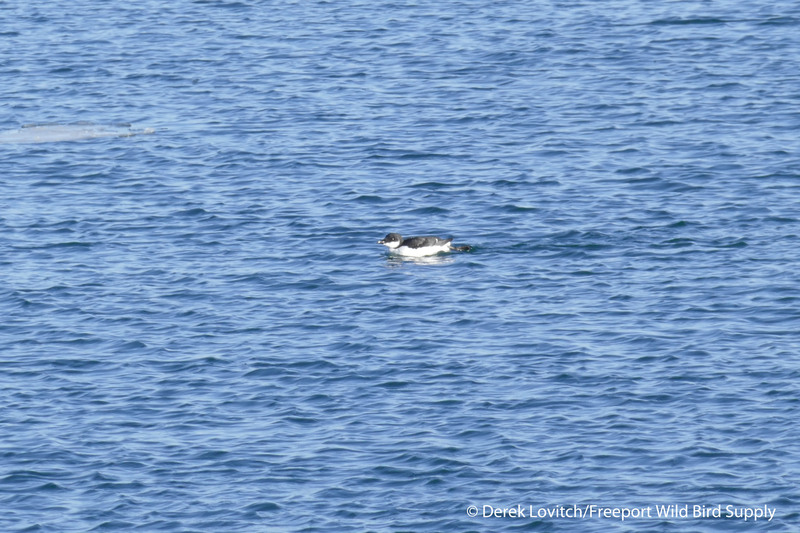 In the water, winter ducks and waterbirds are rapidly increasing: 31 Red-necked Grebes, 15+ Red-throated Loons, all three scoters, and a whole bunch of Long-tailed Ducks were among the growing legions today. And then, I came into the store for a couple of hours of work this afternoon and was distracted by a Dickcissel at our feeders! After spending so much time sifting through urban House Sparrow flocks yesterday, of course one would show up right in front of me. It was a long overdue addition to our store’s yard list – #114! And it was my 5th mainland Dickcissel of the fall. While the appearance of a vagrant after a storm could simply be coincidence, storms can facilitate the departure of already-wayward strays (to oversimplify things a bit). It’s hard to pin any one bird down to any particular weather event, but the appearance of a Swainson’s Hawk (about 6 or 7 state records) that was nicely photographed at the Cadillac Mountain Hawkwatch in Acadia on Friday, only served to further flare my Rarity Fever Symptoms. However, despite my best efforts, I didn’t turn anything of great significance up this weekend, and nor did anyone else in Maine. From the lack of birdlife in many Portland spots (the ones that still have vegetation that is!) and especially in the warm Cape Elizabeth microclimates that I have been checking, it’s possible that the mild weather (remember we’ve only had that once cold snap so far) has simply not yet concentrated lingering/pioneering individuals and wayward vagrants in the little nooks and crannies that we seek them in at this time of year. And with a very mild week in store, perhaps it will be a little longer before we see them concentrate. But there is one thing we can be sure of: there will be a “Mega” rarity soon. How do I know? Because I am going away during Rarity Season! This entry was posted in Birding in Maine, Weather and tagged "Birds, Birding, Blackpoll Warbler, Cape Elizabeth, Dickcissel, Eastern Promenade, Freeport Wild Bird Supply, Issues, Maine, Orange-crowned Warbler, Pond Cove, Portland, rarities, Rarity Roundup, Rarity Season, Reid State Park, Snow Bunting, South Portland, Trundy Point, vagrants, Weather, West Commercial Street on November 2, 2015 by Derek. Two weeks ago (October 24th to be exact), I posted a blog heralding the arrival of “Rarity Season” here in Maine. The next day, a Townsend’s Solitaire was found on Hermit Island in Phippsburg. “Here we go,” I thought. Unfortunately, things didn’t pick up immediately. In fact, despite some very good birding for the next week, there were few rarities discovered: a few Orange-crowned Warblers here and there, but a lot of “lingering” migrants. American Tree Sparrows, Snow Buntings, and a lot of waterbirds arrived, but these are all typical of the season. Personally, I had some great birding that week, such as an impressive array of tarrying shorebirds (led by the continuing family group of American Oystercatchers, a Hudsonian Godwit, and 6 Red Knots) in and around Biddeford Pool on the 27th, a nice diversity of birds at Reid State Park with Jeannette on the 28th (Tennessee Warbler, first-of-fall Snow Bunting, an impressive 473 Sanderlings), a huge count of 915 Ruddy Ducks and a continuing hen Redhead (a rarity) at Sabattus Pond with a friend on the 30th, more late shorebirds with 2 Semipalmated Sandpipers and 3 White-rumped Sandpipers at Pine Point on the 31st, and migrant sparrows in local patches and under feeders, including an increasing number of Dark-eyed Juncos and American Tree Sparrows. I also enjoyed two light flights at Sandy Point. And of course there are the goose fields to scour. (Don’t forget that I post near-daily reports to the store’s Facebook Page). So yeah, I love October birding, even without rarities, and while landbird diversity decreases in November, there is still a lot of fun stuff to uncover. While rarities had been few during the first week or so of Rarity Season, I think the mild weather played a role: birds have just not been concentrated yet in warm microclimates and seasonally-productive microhabitats. Plus, with more birders in the field on the weekends, more “good” birds are usually discovered. Unfortunately, the weekend of Nov 1-2 didn’t exactly invite a lot of people outside. In fact, for the first time, my annual Southcoastal Maine Rarity Roundup (where a group of us get together to scour the coast) was postponed. The massive coastal Nor’easter produced a heavy, wet, early-season snowfall (over 15” in Bangor and the Camden Hills!) and very strong north to northeasterly winds. It was a nasty day. While sea-watching was undoubtedly fantastic in periods when there was actually visibility, few reports of anything trickled in, as most birders stayed inside or found little of interest to report. The exception was a Greater White-fronted Goose, the first of the season, at the Greater Yarmouth Goose Fields. With Jeannette out of town, my time was limited on Sunday and Monday mornings, but a walk with Sasha at Florida Lake Park on Sunday morning yielded a shock, with 5 Redheads. These were my 154th Patch Bird here, and while I went there hoping for some grounded waterfowl, these were definitely not the species I was expecting! But in the wake of the storm, the first really cold air of the season arrived. Portland had its all time-record latest freeze, and for the first time, it received a measurable snowfall before the first freeze! Not surprisingly, some interesting birds arrived at feeding stations. There was a Baltimore Oriole at a Cape Elizabeth feeder and a Dickcissel at a Winterport feeder, for example. Plus, more Dark-eyed Juncos, American Tree Sparrows, and the first Fox Sparrows have filtered in (my first of the fall was in our Pownal yard on Monday morning). The usual smattering of late “lingering” warblers have been noted here and there as well, and there are a few very late Hudsonian Godwits and other shorebirds tarrying here and there. With another active week of weather, I was antsy to get out birding, but unfortunately my schedule was a little busy. I had Tuesday, however, and made the most of it. Although I failed to turn up anything of note in the morning on Bailey and Orr’s Islands in Harpswell, Sabattus Pond was excellent again later that afternoon, led by still amazing counts of Ruddy Ducks, and now a pair of Redheads – it’s shaping up to be a very good fall for them in Maine. And then this morning in Cape Elizabeth was exceptional. In fact, it was one of the best mornings that I have had so far this late fall. There was an Orange-crowned Warbler at Kettle Cove, a Gray Catbird at Crescent Beach State Park, and a Blackpoll Warbler with a Common Yellowthroat at Pond Cove. But 2 hours on a private farm was absolutely unreal: Two Clay-colored Sparrows, a Dickcissel, an Orange-crowned Warbler, a wicked late Prairie Warbler and Lincoln’s Sparrow, an Indigo Bunting, 2 Common Yellowthroats, a Northern Goshawk, and my first Northern Shrike of the year, a brown immature. 100+ each of Dark-eyed Junco, House Finch, and American Goldfinch; 75+ each of Song and White-throated Sparrows; 40+ Swamp and 20+ Savannah Sparrows. And a single White-crowned Sparrow was my 10th sparrow species here today! 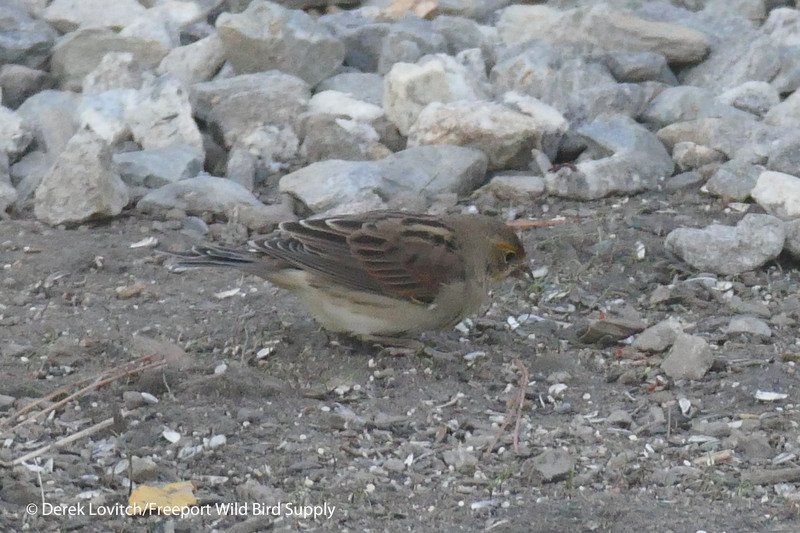 1 of 2 Clay-colored Sparrows present this am. But now we’ve reached the weekend, and I expect some fun stuff to be found. Surrounding states have also been relatively slow for rarities (but New Hampshire has started to pick up with continuing Yellow-headed Blackbirds and now a Western Grebe), likely due to the same factors as here in Maine, principally the mostly mild weather to date. Sunday will be our Rarity Roundup here in Maine, so I will look forward to seeing what we find – there has to be something really good out there! And if Cape Elizabeth today was a sign of things to come, the RR should be a whole lot of fun. 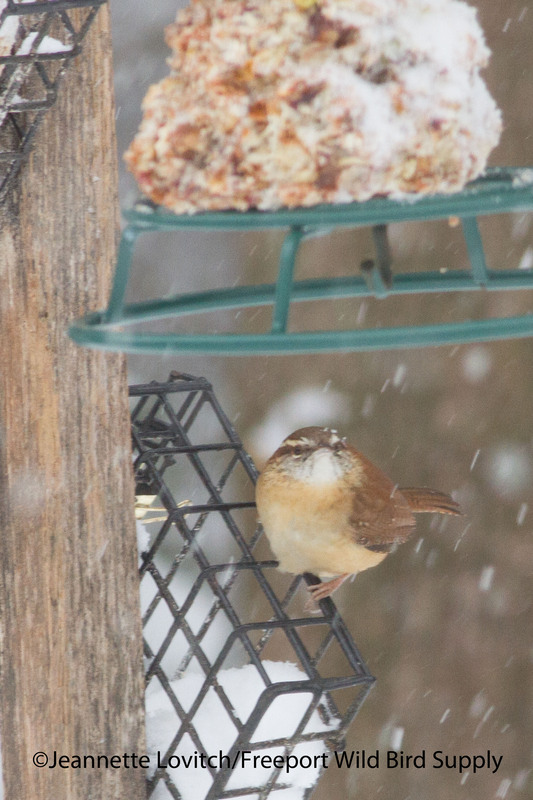 This entry was posted in Birding in Maine and tagged "Birds, Birding, Cape Elizabeth, Clay-colored Sparrow, Rarity Roundup, rarity seasons, Sabattus Pond, sparrows, vagrants, Weather on November 7, 2014 by Derek. Late October through early November is traditionally the best “rarity season” in Maine, where vagrants from all directions are hoped for, and even expected. We’ve been in a rather active and dynamic weather pattern of late, and this may help to usher vagrants in our direction. While weather rarely “blows” birds off-course, winds and weather systems can certainly facilitate their arrival in far-flung places, especially when combined with some sort of misorientation (for a thorough discussion of the concept, see Chapter 7 of my book, How to Be a Better Birder). As October progresses, the nights get longer, and the days (usually) get colder. The growing season comes to an end (although in many spots the killing frost has not yet reached the immediate coastline yet this year), and food sources become greatly limited. 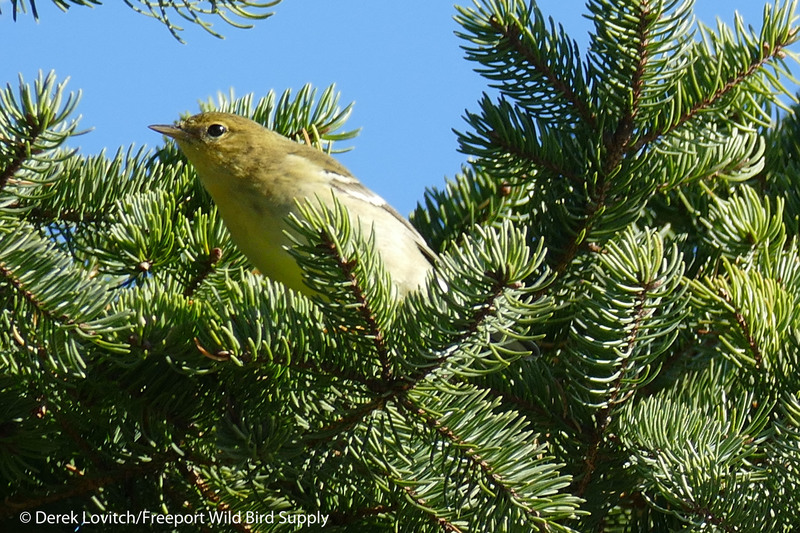 This can push vagrants that may have arrived over the course of the fall migration into favorable micro-climates and patches of seasonal food abundance. More recently-deposited vagrants, “late/lingering” migrants, and other more typical species can also concentrate in such prime areas, such as urban parks, coastal migrant traps, and so on. Let’s take a look at some of the recent weather, and attempt to identify some possible species to consider. Over the past ten days, above normal temperatures were regular, thanks to southerly winds. 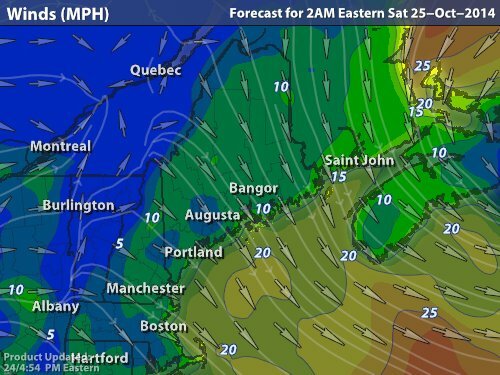 Take a look at the wind map from October 13th, for example. Strong southerly winds pumped warm air into the area from the Deep South and the Bahamas (and the South Atlantic Bight). These are favorable conditions for depositing “180-degree misoriented migrants” from the south, such as Summer Tanagers and White-eyed Vireos. I wonder if it’s a little too late for a big push of southern birds, however, as many of the Neotropical migrants have already departed the continent. Meanwhile, that extensive southerly flow all of the way into Mexico is the type of weather pattern that can facilitate the arrival of long-distance vagrants, such as Fork-tailed Flycatcher. Sparrows are on the move now, and northerly winds with cloudy skies overnight on 10/18 to 19 resulted in a big push of sparrows. The low ceiling likely resulted in disorientation of these low-flying migrants by the big city lights, resulting in a massive flight of birds in Portland’s East End on the morning of the 19th. I estimated over 2000 White-throated Sparrows and 500 Song Sparrows just on the Eastern Promenade alone, with dozens more in almost every lot I checked. A hundred White-throats were in the North St Community Garden, and by the end of the morning, I had tallied 8 species of sparrows, and impressive numbers of Chipping Sparrows (76) and Eastern Phoebes (15) among others. Although 2 Red-bellied Woodpeckers were my 175th species on my Eastern Promenade Patch List, I was surprised that I could not tease out any rarities from the volumes of birds (the sheer number of birds plus gusty winds hampered detection, no doubt). 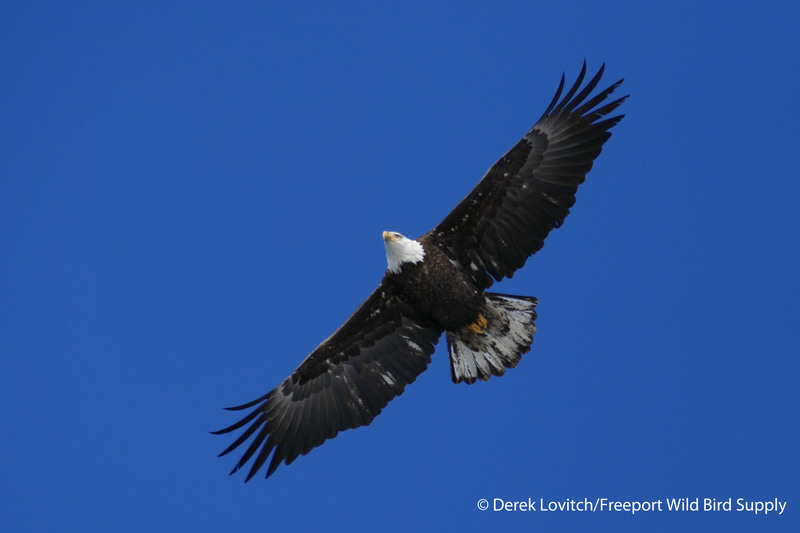 By 10/19, a strong cold front – a rare occurrence this season – pushed through, and with it, a huge flight of migrants. I tallied over 1100 birds at Sandy Point on the morning of the 20th, led by 461 Yellow-rumped Warblers and 159 American Robins. You can see how strong and extensive these northwesterly winds finally were from the wind map that day. Rain began to arrive in the afternoon of the 21st, and it didn’t let up until this morning. This massive coastal Nor’easter drenched Maine with up to 5” of rain, and moderate to strong northeasterly winds battered the state, especially the coast. Birding was a challenge on Wednesday and Thursday, as strong winds and often-heavy rain made things difficult. Rain and coastal fog and mist precluded seawatching, and any lake-watching for grounded waterfowl was rendered impossible by visibility and waves. Essentially, feeder-watching was the best bet these two days, and a growing contingent of sparrows at both our home and here at the store provided the entertainment. About 200 Common Grackles descended into our Pownal yard on the 23rd as well. But now, today (Friday), this massive storm is finally pulling away. 1 White-throated Sparrow (flew in off the water at 8:05am). Next up was Kettle Cove, where a nice diversity of migrants, especially sparrows, also included an Orange-crowned Warbler and 3 Common Yellowthroats. 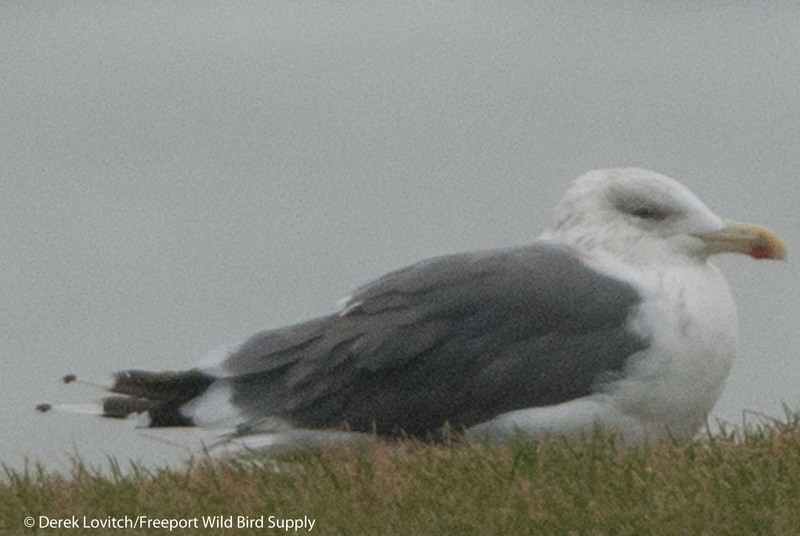 Even more interesting was this gull, which appears to be a hybrid Herring x Great Black-back. Intermediate in size and shape between the two, and with an intermediate mantle color, the short wings and pinkish legs separate it from Lesser Black-backed. A local sparrow-rific patch of private property was fruitful as well. Although a very tardy Bobolink was the only surprise here, plentiful numbers of sparrows included 200+ White-throated, 100+ Song, 50+ Swamp, 50+ Savannah, 50+ Dark-eyed Juncos, at least 10 White-crowned Sparrows, and a single Lincoln’s Sparrow. A Red-bellied Woodpecker and my second Carolina Wren of the morning were added to the tally. A male Black-throated Blue and a female Black-and-white Warbler joined Palm and Yellow-rumped Warblers feasting on seaweed flies in and near the wrack at Pond Cove, where another Red-bellied Woodpecker was sounding off. On my way back, I swung through the goose fields, and clearly more Canada Geese have arrived in the last few days. 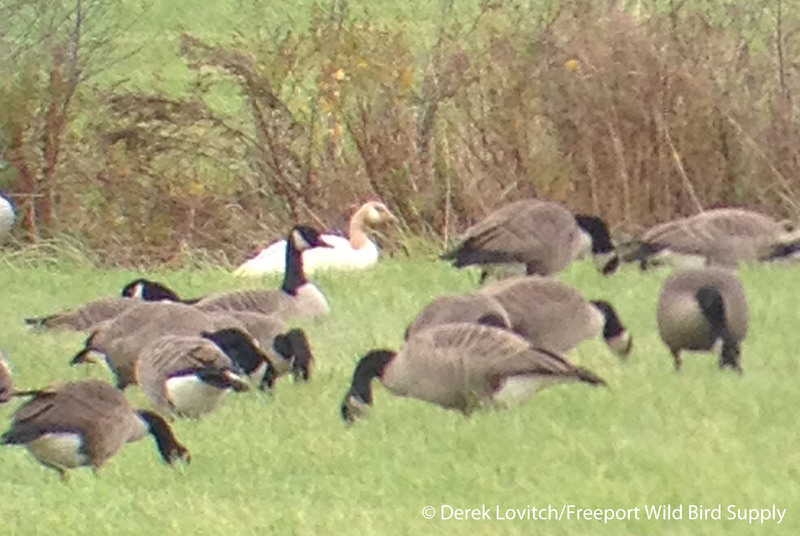 718 was a new season-to-date high count, with the most interesting new arrival being this spiffy leucistic Canada. Unlike a hybrid with a Snow or a Domestic Goose, this neat bird was the same shape and size as the average Canada, but with a dull brownish cast to the head, neck, and wingtips. As this nasty low rides up into Atlantic Canada and beyond, strong wrap-around winds will offer the potential to displace Northern Wheatears or rare geese from Greenland. Meanwhile, next week, we’ll see unseasonable warmth return on southwesterly winds (“vagrant winds” as I like to call them), just the type of scenario that can facilitate the arrival of strays from the southwest, such as Cave Swallows and Ash-throated Flycatchers. They will also facilitate the survival for at least a little longer of vagrants that are still present but as so far gone undetected. There isn’t one predominate pattern that yields a strong suggestion of any particular vagrant (or group of vagrants) from any particular direction. However, it is clear that we are getting a nice sample of different conditions that could produce some fun stuff. Sparrows will make up the bulk of the flight, especially White-throated Sparrows and Dark-eyed Juncos. If the clouds clear by dawn, I might get a big push at Sandy Point. If the ceiling stays low overnight, look for concentrations of sparrows in migrant traps, especially in and around bright cities. Meanwhile, during the day, a lovely weather forecast should get plenty of birders out into the field. Needless to say, I will be out looking, and I hope you will to! I look forward to what the coming days and weeks will bring. 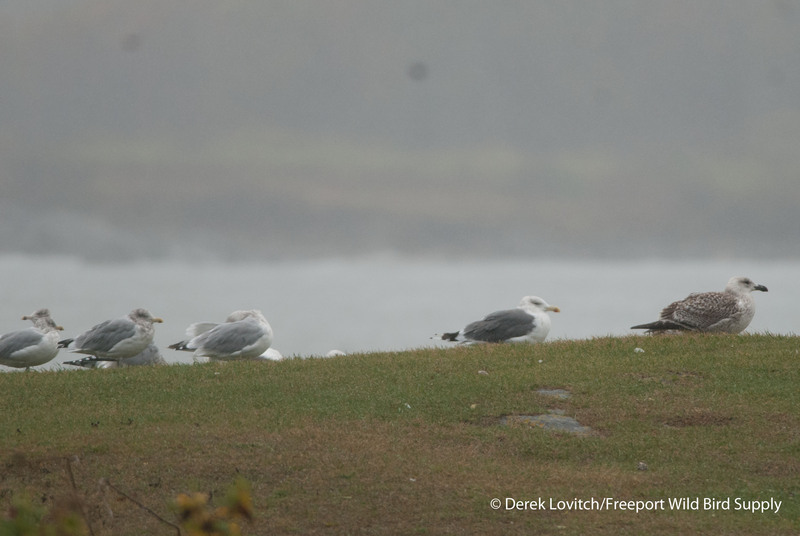 This entry was posted in Birding in Maine, Weather and tagged "Birds, Birding, Canada Goose, Cape Elizabeth, Greater Yarmouth Goose Fields, Herring x Great Black-backed Gull, Kettle Cove, Leucisitic Canada Goose, migration, predictions, seawatching, sparrows, vagrants, warblers, Weather on October 24, 2014 by Derek.